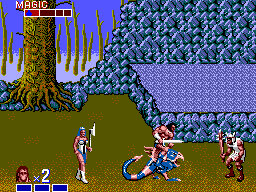 Golden Axe is one of the famous Arcade titles from Sega. The Story is in every Game nearly the same: Death Adder has stolen the magic Golden Axe and you are on a Journey to retrieve it. 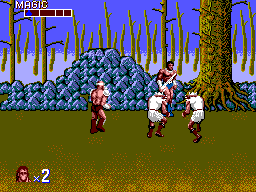 This is the Conversion of the first Part and it has been a bit downgraded to fit the capabilities of the Master System, which means there is only one Character, the Barbarian Tarik. With only one figure left, its a shame this game has no 2-Player Mode. The Characters move a bit too fast, while the Background is rather slow which makes this Animation look a bit weird. With the 3-Dimensional Levels (you can go up, down, left and right) its sometimes a bit hard to put your Figure in one line with the Enemies, so it happens you want to attack and just hit the Air. But, the Game is still great and make Fun. Not as great as the Arcade Version, but still good to Play. The Graphic is awesome. The Levels are highly Detailed and all the Characters are really big, compared to other Master System Games, but they are not as big as in the Arcade Versions. The Colors sometimes are a bit odd, in the first Level you see blue Stones (Maybe its the Graphic Designer from Enduro Racer?). The Magic Effects are nice done, although I never saw the Stone one (I like to play with Fire). While the Magic Scenes, the Background turns black, so you see only the Characters and the Magic. But that is not too bad, especially if you think the same thing happens on the Genesis. The Animation while walking are a bit jerky and doesn't look to good. Every other thing, from jumping over running to the sword attacks look fine. Music is great. 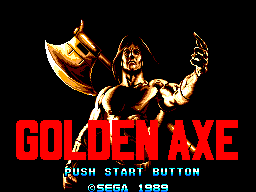 Call me a Freak but I have the Golden Axe Theme as Ringtone for my Mobile Phone. Its really great done and I like it. The sound effects are good, although the death screams are missing (But that make this the only Golden Axe 1 Version, that is not banned here in Germany). All other Effects are nice and realistic. As always the game is easier to play with the standard game pad, instead with the arcade Stick. The Controls react fast and the only thing is the missing 3rd Button for the Magic, so you have to press both button to use it. That means, your character has no 'Escape'-Move you could use when you are surrounded by two enemies. Its a good Game and its fun to Play even if you already beat the Game. I just miss the 2-Player Mode and the other 2 Character, with that the Game would be a little better, cause you can beat the Game with 3 different Character, instead of taking always the same old Barbarian. This Game is still in the Top-20 of the Master System Games (at least for me). While it has its flaws, it is still one of the better Arcade Versions and graphically it shows what the Master System can handle.